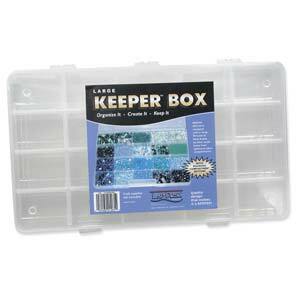 The keeper box lid is designed with a snug fit track to keep beads from spilling into other compartments. The bottom of the compartments are rounded which makes it easy for you to pick out your beads. These boxes are also stackable. They have little "feet" which fit into the dimples on the lids of the boxes. This product was added to our catalog on Thursday 29 May, 2014. Organza Drawstring Pouches - 3" x 4"